Although summer days are long, they don't leave much time for reading. I carefully select a few books to keep me company when I can no longer bear the heat. Limited time causes me to be more discriminating in my choices, which makes reading more enjoyable and beneficial. ~March (audio). Exquisite prose is the mark of this captivating story. I was hooked from the first pages. ~A Place for Weakness: Preparing Yourself for Suffering (Kindle). Michael Horton's insight on suffering and what it means for the Christian is outstanding. ~Soul Surfer: A True Story of Faith, Family, and Fighting to Get Back on the Board . CJ wanted me to read this with her. An encouraging story, to say the least. Bethany Hamilton is a strong role model for young women. ~The Organized Heart: A Woman's Guide to Conquering Chaos (Kindle) This is a powerful book that is far from the ordinary "how to" organizing fare. Staci Eastin has spoken directly to my heart. While I've done much to improve the organization in my home the past few years, I've learned there are still some heart issues to be addressed. ~The Rural Life . I liked this book. I put it down because it's one that's easy to come back to. For some reason, I think of it as more of an Autumn read. ~What Is a Healthy Church Member? (IX Marks) . A short, but impressive read. ~Snow Flower and the Secret Fan. I'm just getting into this one. ~Unbroken: A World War II Story of Survival, Resilience, and Redemption (Audio). Just waiting for the library to get it to me! ~The Next Story: Life and Faith after the Digital Explosion. I'm pretty sure this one is going to be worth my while. ~The Help. I'm probably one of the last women in the country to read this book. I'm finally going to get around to it. 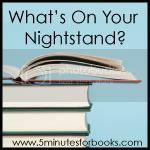 Visit 5 Minutes for Books to see what others are reading. I have yet to read The Help. You're not the only one! :) I am looking forward to getting my eyes on a copy before the movie comes out next month. Another one who hasn't read The Help, so you are not alone! Geraldine Brooks sounds like an intriguing author; I'll definitely be checking her out. Whoops. I'm not sure if you should beat me to Unbroken. I've had it for too long already. I'm now seriously looking forward to seeing The Help on screen now that I've read that one. What is a Healthy Church Member sounds like a seriously thought-provoking read!! I saw the movie Soul Surfer but haven’t read the book yet. Maybe my daughter and I can read it together this fall. I’ve got The Organized Heart on my list. I’m waiting for my library to have an opening for Unbroken also. A great list, as usual! You're not the last to read The Help! I just read it last month. It was good! I have never even heard of "The Help" until now. I am going to go google it. Now, I want to start the Organized Heart which is on my to read Amazon list. The Help was a interesting read. I look forward to how it will play out in a movie! I haven't read The Help yet either. I have enjoyed What Is a Healthy Church Member though. I saw The Next Story on someone else's list. It looks interesting! I only just read The Help. I really, really need to get myself a copy of An Organized Heart. I am constantly reading about it! My husband read Unbroken and couldn't stop talking about it. An interesting and compelling story, to be sure. I read The Help a couple of years ago (back when Jennifer first posted a review, I think). I want to read it again before the movie comes out but I think I've lent out my copy! Thanks for the recommendation to read March. Liked it. A lot.